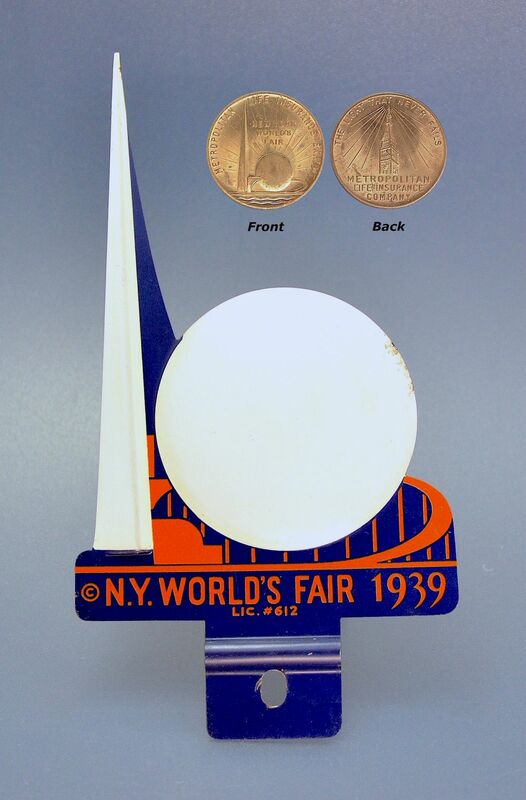 The car mascot and medal were produced as promotional material for the 1939 New York World's Fair. The car mascot is in enamelled pressed metal and depicts the iconic Trylon & Perisphere structures that were the focal point of the Fair. The Trylon & Perisphere are in off-white enamel and the supporting structures are in terracotta & blue enamel with "N.Y. World's Fair 1939 Lic. 612" in terracotta lettering below. The gilt metal small round medal /token was issued by the Metropolitan Life Insurance Company who presumably exhibited at the Fair. The obverse depicts the Trylon & Perisphere with "New York World's Fair" above and "Metropolitan Life Insurance Exhibit" above. The reverse depicts a tower with light rays radiating from the top with "Metropolitan Life Insurance Company" below and "The light that never fades" above. Iconic images and highly collectible memorabilia. Covering 1,216 acres, in Flushing Meadows, New York, the 1939 New York World's Fair was erected on an old ash-dump. An idea dreamed up during the height of the depression, the theme of the Fair was "The World of Tomorrow." It was a look to the future and was planned to be "everyman's fair" where everyone would be able to see what could be attained for himself and his community. Government agencies, corporations, civic groups, and smaller organizations from around the world arrived in huge numbers, building extraordinary pavilions and setting up exhibitions. It opened on April 30, 1939 - the 150th anniversary of the inauguration of George Washington. 206,000 visitors attended the first day of the Fair even though some of the pavilions were still under construction and were not open. President Franklin D. Roosevelt gave the opening speech which was watched by an estimated 1,000 visitors on 200 televisions sets in various locations throughout the Fair. The iconic Trylon and Perisphere became the central symbol and focal point of the 1939 World's Fair. They housed a diorama called "Democracity," a utopian city of the future. Images of the two structures were reproduced on a wide range of promotional materials and were the fairground's focal point.The United States issued a postage stamp in 1939 depicting the Trylon and Perisphere. Unfortunately neither structure survives today.